When Windows 7 was announced several months ago, it was stated that it would support multi-touch displays. Even though Windows 7 beta is available, I was surprised that I didn’t see many multi-touch displays at CES, except from HP. 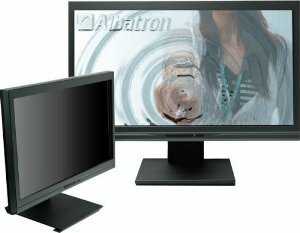 A company known as Albatron has been working on a multi-touch display for quite some time, and has recently announced that they finally have a 21.5 inch display that is consumer-ready. There is quite a buzz about this MTD (multi-touch display) on many other tech blogs, but very little is known about it. We do know that there are sensors embedded in the bezel instead of the surface, which will create a brighter image as well as superior durability. Other vague details that we know are that it supports 120Hz with USB connectivity to the PC. It also has DVI and VGA inputs as well. The Albatron 21.5 inch MTD will be available sometime in March. By the way, the MTD acronym isn’t an official acronym for Multi-touch Display. It is something that I made up, and I’m going to see in a few months if that this abbreviation catches on. After all, I have no doubt that Windows 7 will create a great need for more MTDs.